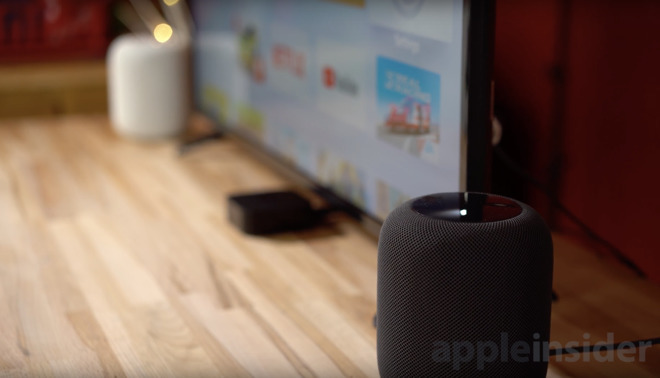 Following the release of AirPlay 2, we recently compared a set of stereo paired HomePods connected to an Apple TV to a home theatre surround sound system, and Apple's smart speakers were found to be extremely lacking. The two HomePods even seemed quieter than a $350 soundbar usually used to watch television in a bedroom. The seemingly lower volume prompted us to use an audio decibel meter to see how loud the HomePods really are. During an intense fighting scene in Thor: Ragnarok, the stereo HomePods only put out a peak volume of 77 decibels, a fairly weak number for $700 worth of speakers. There seemed to be an issue which lowered the volume output to our stereo HomePods, but then we found a fix for the problem. On the Apple TV, go to Settings, then Video & Audio, followed by Surround Sound. Select Turn Convert Format On, then switch it to Stereo. Replaying the same action scene, the HomePods achieve a much better peak volume of 83 decibels, which due to the logarithmic scale of decibels, is roughly three times louder. This small change made the viewing experience much more enjoyable. As a crude comparison, this is similar to the difference in volume between a vacuum cleaner in the same room and standing 30 feet away from the tracks as a freight train passes by. Curious to see how the built-in speakers of the television compared to stereo HomePods, the same test revealed that the HomePods were still quieter, even after the volume fix. 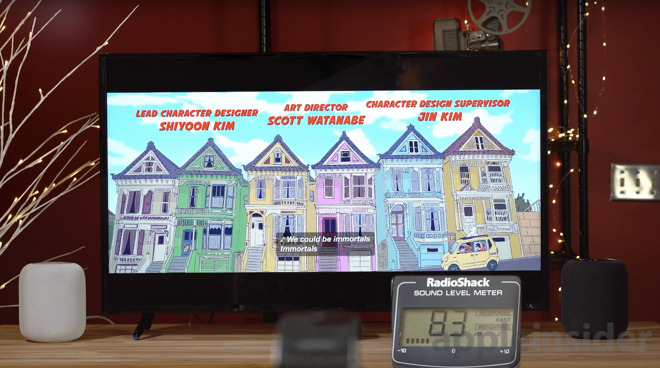 Of course, the sound quality from the TV speakers was obviously worse, but it seems ridiculous for a cheap $350 4K smart TV to have louder speakers than two HomePods paired in stereo. We then decided to compare the volume while watching a movie to what the HomePods produce when playing music. We rolled the end credits of Disney's Big Hero 6 to listen to "Immortals" by Fall Out Boy. The movie was purchased through the iTunes Store. The meter recorded 83 decibels, the same peak volume achieved in the earlier test, which seems fine. We then asked Siri to play that exact song straight through the HomePods, and we immediately noticed a massive difference. 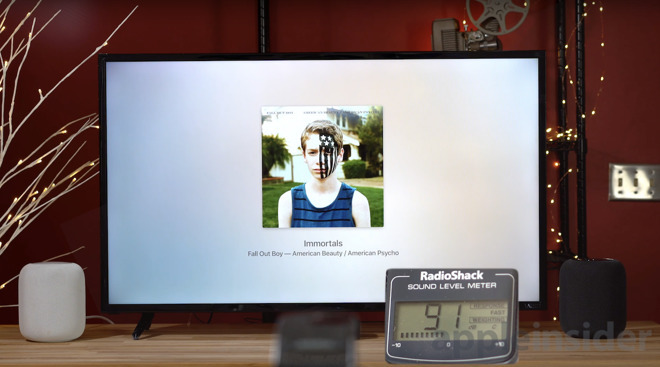 The stereo HomePods played the song at a peak of 91 decibels. Ideally, this is as loud as we wish the HomePods would play while watching a movie on the Apple TV. Ultimately, while we found out how to make the stereo HomePods play quite a bit louder than under default settings, it is still way too quiet to use a pair as a viable home theater system replacement. 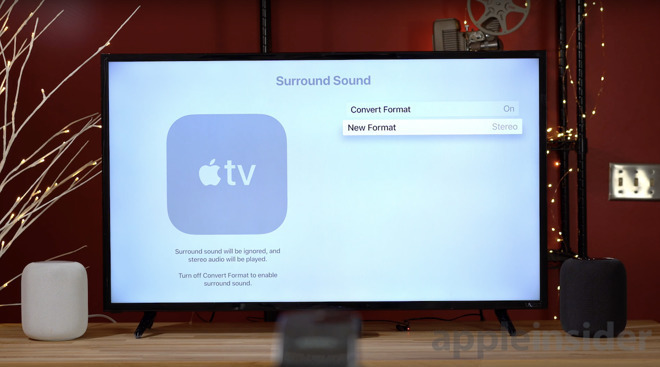 Apple does have an option in the Apple TV settings to reduce loud sounds, but we actually wish Apple would include an option to amplify the sound altogether. Hopefully Apple addresses this issue in a future update, so Apple TV users who like their action loud can use a set of stereo HomePods as their dedicated external Apple TV speakers.